This morning was our first day in the 30’s, 38 degrees, in quite sometime. It was 38 but it felt good out this morning, I love the Fall! Back into the 80’s next week though. What better to have a crisp sunny day while watching a day of College Football than Cheese Coneys, Buffalo Chili Turkey Dogs. I used the 3 Bean Buffalo Chili I had leftover from the other night for the Chili, I had a lot leftover so most of it went to the freezer. 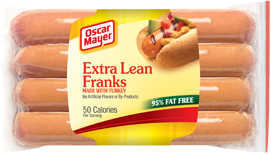 I then used Oscar Mayer Extra Lean Turkey Franks, my new choice of Hot Dogs. I warmed the Chili up and boiled my Turkey Franks, about 5 minutes in boiling water. I served it on a Healthy Life Whole Grain Hot Dog Bun, topped with French’s Yellow Mustard, the Buffalo Chili, and Sargento Reduced Fat Shredded Sharp Cheddar. Now that’s a Chili Dog!! Great taste in every bite as the 5 ingredients all come together! To add a little crunch I had a half serving of Ruffle’s Reduced Fat Potato Chips and an ice-cold Diet Dr. Pepper. For dessert later I had a bowl of sliced up some fresh Peaches I had bought earlier in the week. These hardwood smoked, bun length turkey franks are 95% fat free and only 50 calories per serving. Enjoy this lean poultry option the next time you’re looking for a hot dog, but without all the fat and calories of a beef frank. Ingredients: TURKEY INGREDIENTS (TURKEY, MECHANICALLY SEPARATED TURKEY), WATER, MODIFIED CORN STARCH, CORN SYRUP, CONTAINS LESS THAN 2% OF DEXTROSE, POTASSIUM CHLORIDE, FLAVOR, HYDROLYZED BEEF STOCK, SODIUM PHOSPHATES, SALT, SODIUM PROPIONATE, MUSTARD FLOUR, SODIUM DIACETATE, SODIUM BENZOATE, LEMON JUICE SOLIDS, SODIUM ASCORBATE, EXTRACTIVES OF PAPRIKA, SODIUM NITRITE. We are already getting some humid weather, not bad just enough to make it a little uncomfortable. On top of that I’m battling my Spring sinus problems. Happens every Spring and Winter like clockwork! Passes in about a week after the sinuses adjust. Because of that I really didn’t feel like putting a lot of effort into dinner so I made simple preparing a couple of Chili Dogs. I used Ball Park White Smoked Turkey Franks that boiled. Just boiled in hot water for about 5 minutes and their done. Served them on Aunt Millie’s Light Whole Grain Buns. I topped them with Hormel Turkey With Beans. Comes in a can just heat it up in a small sauce pan and it’s ready. I also topped them with a bit of French’s Yellow Mustard and Kraft 2% Shredded Sharp Cheddar Cheese. For dessert later a Jello sugar Free Double Chocolate Pudding topped with Cool Whip Free Topping. 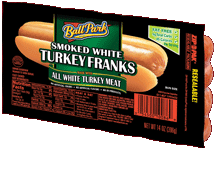 Ball Park Bun Size Smoked White Turkey Franks Dial up the lean while you dial in the flavor. Hormel Turkey Chili with Beans Hormel Chili, Turkey with Beans, 99% Fat Free Always easy and always delicious, Hormel® chili is made with carefully selected beef, red beans, tomatoes and a special combination of spices. Our choice ingredients are blended and simmered, resulting in a rich and hearty flavor—perfect for dips, baked potatoes, hamburgers, casseroles, nachos, hot dogs, French fries and so much more. 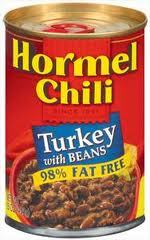 Hormel® chili now comes in 10 varieties and sizes, including a less sodium variety. Whether you serve it in a bowl, on a hot dog, or as a topping for fries and nachos, choose the chili craved by chili lovers—Hormel® chili. The word frankfurter comes from Frankfurt, Germany, where pork sausages served in a bun similar to hot dogs originated. These sausages, Frankfurter Würstchen, were known since the 13th century and given to the people on the event of imperial coronations, starting with the coronation of Maximilian II, Holy Roman Emperor as King. Wiener refers to Vienna, Austria, whose German name is “Wien”, home to a sausage made of a mixture of pork and beef (cf. Hamburger, whose name also derives from a German-speaking city). Johann Georg Lahner, a 18th/19th century butcher from the Franconian city of Coburg, is said to have brought the Frankfurter Würstchen to Vienna, where he added beef to the mixture and simply called it Frankfurter. Nowadays, in German speaking countries, except Austria, hot dog sausages are called Wiener or Wiener Würstchen (Würstchen means “little sausage”), in differentiation to the original pork only mixture from Frankfurt. In Swiss German, it is called Wienerli, while in Austria the terms Frankfurter or Frankfurter Würstel are used. Around 1870, on Coney Island, German immigrant Charles Feltman began selling sausages in rolls. Others have supposedly invented the hot dog. The idea of a hot dog on a bun is ascribed to the wife of a German named Antonoine Feuchtwanger, who sold hot dogs on the streets of St. Louis, Missouri, United States, in 1880, because his customers kept taking the white gloves handed to them for eating without burning their hands. Anton Ludwig Feuchtwanger, a Bavarian sausage seller, is said to have served sausages in rolls at the World’s Fair–either the 1893 World’s Columbian Exposition in Chicago or the 1904 Louisiana Purchase Exposition in St Louis–again allegedly because the white gloves he gave to customers so that they could eat his hot sausages in comfort began to disappear as souvenirs. only the St. Louis Browns, but also an amusement park. In 1916, a German American employee of Feltman’s named Nathan Handwerker was encouraged by celebrity clients Eddie Cantor and Jimmy Durante to go into business in competition with his former employer. Handwerker undercut Feltman’s by charging five cents for a hot dog when his former employer was charging ten. At an earlier time in food regulation the hot dog suspect, Handwerker made sure that men wearing surgeon’s smocks were seen eating at Nathan’s Famous to reassure potential customers. The term “dog” has been used as a synonym for sausage since 1884 and accusations that sausage makers used dog meat date to at least 1845. In the early 20th century, consumption of dog meat in Germany was common. The suspicion that sausages contained dog meat was “occasionally justified”. According to a myth, the use of the complete phrase “hot dog” in reference to sausage was coined by the newspaper cartoonist Thomas Aloysius “TAD” Dorgan around 1900 in a cartoon recording the sale of hot dogs during a New York Giants baseball game at the Polo Grounds. However, TAD’s earliest usage of “hot dog” was not in reference to a baseball game at the Polo Grounds, but to a bicycle race at Madison Square Garden, in The New York Evening Journal December 12, 1906, by which time the term “hot dog” in reference to sausage was already in use. In addition, no copy of the apocryphal cartoon has ever been found. The earliest known usage of “hot dog” in clear reference to sausage, found by Fred R. Shapiro, appeared in the December 31, 1892 issue of the Paterson (NJ) Daily Press. The story concerned a local traveling vendor, Thomas Francis Xavier Morris, also known as “Hot Dog Morris”. Somehow or other a frankfurter and a roll seem to go right to the spot where the void is felt the most. The small boy has got on such familiar terms with this sort of lunch that he now refers to it as “hot dog.” “Hey, Mister, give me a hot dog quick,” was the startling order that a rosy-cheeked gamin hurled at the man as a Press reporter stood close by last night. The “hot dog” was quickly inserted in a gash in a roll, a dash of mustard also splashed on to the “dog” with a piece of flat whittled stick, and the order was fulfilled. Other early uses of “hot dog” in reference to sausage appeared in the New Brunswick (NJ) Daily Times (May 20, 1893), the New York World (May 26, 1893), and the Knoxville (TN) Journal (Sep. 28, 1893). Pork and beef are the traditional meats used in hot dogs. Less expensive hot dogs are often made from chicken or turkey, using low cost mechanically separated poultry. Hot dogs often have high sodium, fat and nitrite content, ingredients linked to health problems. Changes in meat technology and dietary preferences have led manufacturers to use turkey, chicken, vegetarian meat substitutes, and to lower the salt content. 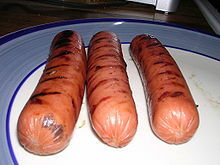 If a manufacturer produces two types of hot dogs, “wieners” tend to contain pork and are blander, while “franks” tend to be all beef and more strongly seasoned. Hot dogs are prepared commercially by mixing the ingredients (meats, spices, binders and fillers) in vats where rapidly moving blades grind and mix the ingredients in the same operation. This mixture is forced through tubes into casings for cooking. Most hot dogs sold in the US are “skinless” as opposed to more expensive “natural casing” hot dogs. As with most sausages, hot dogs must be in a casing to be cooked. Traditional casing is made from the small intestines of sheep. The products are known as “natural casing” hot dogs or frankfurters. These hot dogs have firmer texture and a “snap” that releases juices and flavor when the product is bitten. “Skinless” hot dogs must use a casing in the cooking process when the product is manufactured, but the casing is usually a long tube of thin cellulose that is removed between cooking and packaging. This process was invented in Chicago in 1925 by Erwin O. Freund, founder of Visking which would later become Viskase Companies. The first skinless hot dog casings were produced by Freund’s new company under the name “Nojax”, short for “no jackets” and sold to local Chicago sausage makers. Skinless hot dogs vary in the texture of the product surface but have a softer “bite” than natural casing hot dogs. Skinless hot dogs are more uniform in shape and size than natural casing hot dogs and less expensive. Hot dogs are prepared and eaten in a variety of ways. The wieners may be boiled, grilled, fried, steamed, broiled, baked, or microwaved. The cooked wiener may be served on a bun (usually topped with condiments), or it may be used as an ingredient in another dish. In the US, “hot dog” may refer to just the sausage or to the combination of a sausage in a bun. There have been many nicknames for hot dogs that have popped up over the years. A hot dog can often be seen under the names of frankfurter, frank, red hot, wiener, weenie, durger, coney, or just “dog”. Common hot dog condiments include ketchup, mustard, chile con carne, pickle relish, sauerkraut, onion, mayonnaise, lettuce, tomato, cheese, and chili peppers, or just plain. A Detroit Coney Island hot dog with chili, onion and mustard. tomatoes, onions, sport peppers, bright green relish, dill pickles, and celery salt, but they exclude ketchup. Many variations are named after regions other than the one in which they are popular. Italian hot dogs popular in New Jersey include peppers, onions, and potatoes. Meaty Michigan hot dogs are popular in upstate New York (as are white hots), while beefy Coney Island hot dogs are popular in Michigan. In New York City, conventional hot dogs are available on Coney Island, as are bagel dogs. Hot wieners, or weenies, are a staple in Rhode Island. Texas hot dogs are spicy variants found in upstate New York and Pennsylvania (and as “all the way dogs” in New Jersey), but not Texas. Some baseball parks have signature hot dogs, such as Fenway Franks at Fenway Park in Boston, Massachusetts and Dodger Dogs at Dodger Stadium in Los Angeles, California. The Fenway signature is that the hot dog is boiled and grilled Fenway-style, and then served on a New England-style bun, covered with ketchup and relish. Often during Red Sox games, vendors traverse the stadium selling the hot dogs plain, giving customers the choice of adding the condiments. Cheese Coneys for dinner tonight. 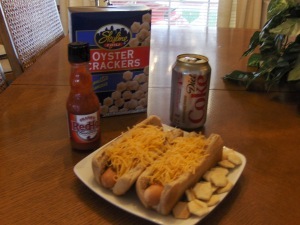 I used Ball Park White Smoked Turkey Franks, 1 Can of Skyline Chili, French’s Mustard, Frank’s Red Hot Sauce (Optional), 4 Slices of Tamed Jalapeno Peppers, Kraft 2% Shredded Sharp Cheese, and Healthy Life Hot Dog Buns. Put it all together and you have the Cincinnati Style Chili Cheese Coney. As an option you can add Chopped Onions. For dessert later a Yoplait 100 Calorie Delight Chocolate Eclair Parfait. It’s Cheese Coneys for dinner tonight. I used Ball Park White Smoked Turkey Franks, 1 Can of Skyline Chili, French’s Mustard, Frank’s Red Hot Sauce (Optional), Kraft 2% Shredded Sharp Cheese, and Healthy Life Hot Dog Buns. Put it all together and you have the Cincinnati Style Chili Cheese Coney. As an option you can add Onions, a lot of people will add chopped Onions to their Coneys. For a dessert/snack later tonight it will be a Mini Bag of Jolly Time Pop Corn. It’s Cincinnati Style Chili Cheese Coneys Night! It’s Cheese Coneys for dinner tonight! If your from or lived in the Cincinnati area you know how good these Dogs are! I used Ball Park White Smoked Turkey Franks, 1 Can of Skyline Chili, French’s Mustard, Kraft 2% Shredded Sharp Cheese, and Healthy Life Hot Dog Buns. 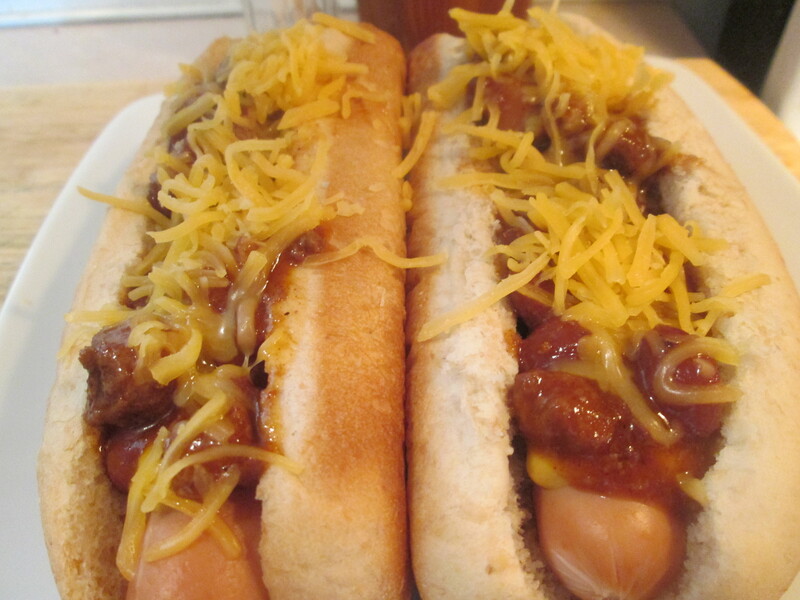 Put it all together and you have the Cincinnati Style Chili Cheese Coney. I’m not a huge fan of Onions but a lot of people will add chopped Onions to their Coneys along with Hot Sauce. For a dessert/snack later tonight it will be a Aunt Millie’s Whole Grain Bagel topped with Laughing Cow Light garlic and Herb Cheese. Cincinnati Style Chili Cheese Coneys! It’s Coney night! I used Ball Park White Smoked Turkey Franks, 1 Can of Skyline Chili, French’s Mustard, Kraft 2% Shredded Sharp Cheese, and Healthy Life Hot Dog Buns. Put it all together and you have the Cincinnati Style Chili Cheese Coney. Had a few Oyster Crackers also, which is a must when having any type of chili. You can also add diced Onions to your Coneys if you like. Ahhh comfort food! Oh yeah it’s Coney night around the old homestead tonight! I used Ball Park White Smoked Turkey Franks, 1 Can of Skyline Chili, French’s Mustard, Kraft 2% Shredded Sharp Cheese, and Healthy Life Hot Dog Buns. Put it all together and you have the Cincinnati Style Chili Cheese Coney. Had a few Oyster Crackers also, which is a must when having any type of chili. You can also add diced Onions to your Coneys if you like. All together makes a one fine dinner! Skyline Chili is a chain of chili restaurants based in Cincinnati, Ohio. Founded in 1949 by Greek immigrant Nicholas Lambrinides, Skyline Chili is named for the view of Cincinnati’s skyline that Lambrinides could see from his first restaurant (which has since been demolished), opened in the section of town now known as Price Hill. Skyline Chili is unique in that it is not chili con carne, the meat dish that originated in (and is the state dish of) Texas. Instead, Cincinnati-style chili is a sauce usually used over spaghetti or hot dogs, containing a unique spice blend that gives it a very distinct taste. Officially, the recipe for Skyline Chili is a well-kept family secret among Lambrinides’ surviving children. However, many Skyline patrons and Cincinnatians believe that the unique taste of Skyline Chili comes from chocolate and cinnamon, spices common in Greek cuisine‘s meat dishes. The general recipe is not unique to Skyline — “Cincinnati-style” chili is sold by several chili parlors in the area including Empress, Dixie, Gold Star Chili, Camp Washington, and other chili parlors. Skyline’s menu includes their signature dishes: cheese coneys (a hot dog topped with Skyline Chili, mustard, onions, and cheese), and 3-ways (spaghetti topped with Skyline Chili and cheese; 4-ways (choice of beans or onions added), and 5-ways (beans and onions both added). Additional menu items include burritos made with Skyline Chili, classic and Greek-style salads, french fries, and baked potatoes topped with Skyline Chili. To accommodate patrons who follow a low carbohydrate diet, Skyline has recently offered low-carb options such as a “coney bowl”—a cheese coney without the bun, and also now serves vegetarian options, using beans and rice in place of chili in many of its dishes. 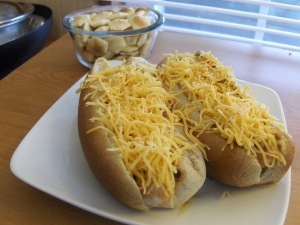 One of my many favorites for dinner tonight Cheese Coneys, Cincinnati Style Cheese Coneys! 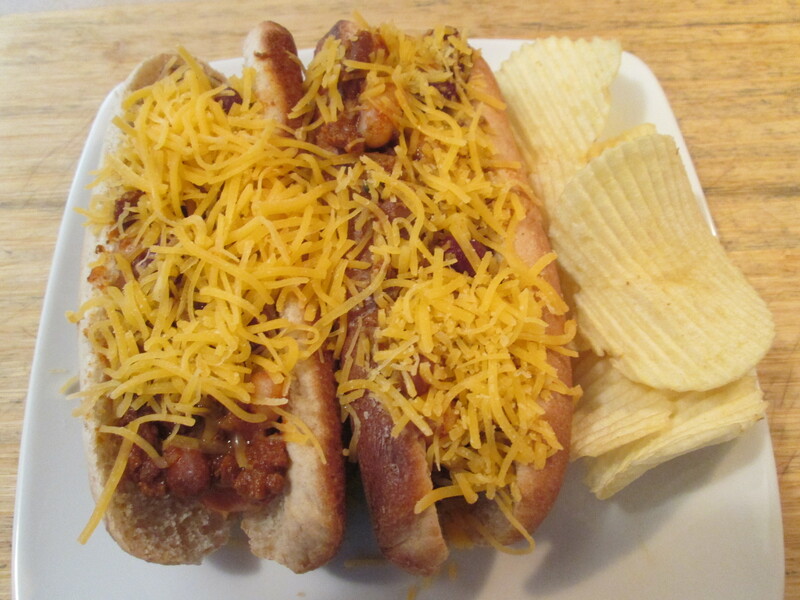 I used Ball Park Smoked White Turkey Franks, Hormel turkey Chili w/ Beans, Kraft 2% Shredded Sharp Cheddar Cheese, Frank’s Red Hot Sauce, and Aunt Millie’s Whole Grain Hot Dog Buns. Boil the Franks 4 -5 minutes and then assemble those Coneys! 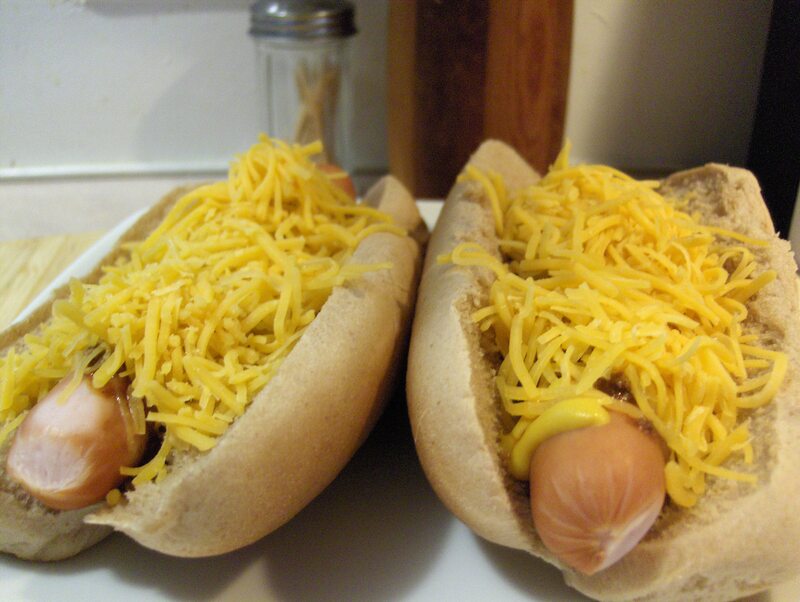 Open the Hot dog Buns up and sprinkle some Shredded Cheese in the Bun, then your Frank, spread the Chili on top of the Frank, add a little Frank’s Red Hot Sauce (Yellow Mustard optional), Shredded Cheese and ENJOY! You can also add some diced Onions or an Jalanpeno slices in there also. Today’s Menu: Cincinnati Style Cheese Coney Casserole. If you’re a fan of Cincinnati Style Cheese Coneys like myself you’re going to love this easy recipe, a Crescent-topped casserole ready in only 30 minutes. Got the idea from a Pillsbury food recipe site but it was over 500 calories so it sounded delicious but I had to lighten up so I did. It’s an easy recipe to make with the original calling for Chili w/ Beans, Hot Dogs, Shredded American Cheese and Crescent Rolls. I lightened it up by using Hormel Turkey Chili w/ Beans, Ball Park Smoked White Turkey Franks, Kraft 2% Shredded American Cheese, and Pillsbury Reduced Fat Crescent Rolls. Comparing those 4 items from the original recipe to the lightened up recipe there was a calorie savings of 245 calories and 2 carbs. That’s the individual count among those ingredients. So this is just one recipe example of the calories and carbs you can cut by using healthier ingredients. I also added in a few dashes of Ground Cinnamon and frank’s Hot Sauce. I always try to add Cinnamon, a great natural for controlling diabetes. My lighter recipe version for this follows. * In 2-quart saucepan, mix Chili, Cinnamon, Frank’s Hot Sauce, and sliced Turkey Franks. Heat to boiling over medium-high heat, stirring occasionally. Spoon chili mixture into ungreased 13×9-inch (3-quart) glass baking dish; sprinkle with cheese. * Separate or cut dough into 4 long rectangles (if using crescent rolls, press perforations to seal). Place on top of chili mixture. Sprinkle with sesame seed. * Bake at 375°F 15 to 20 minutes.